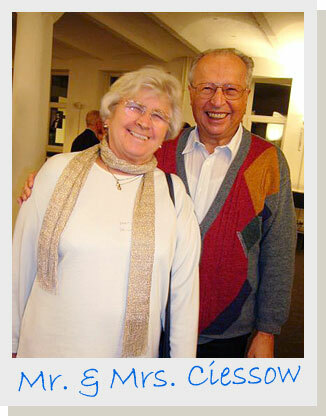 I had a reunion with Mr. and Mrs. Ciessow, with whom my friendship already dates back ten years, at the venue in Berlin of the first game of this year’s Kisei title match. The room was decorated with hanging scrolls brushed by famous go players, including Go Seigen; the exhibition had been arranged by the Ciessows. They are important go friends whom I first met in Berlin. When he was young, Mr. Ciessow was a top player: he was European go champion and he took part in the first international amateur go tournament held in Japan in October 1963 as the German representative. He was also very fond of Japanese culture and he devoted a lot of time to collecting materials related to go and to studying the game. I call Mrs. Ciessow, who has supported him all these years, ‘Mama-san’. I can’t speak German and her English is not very good, but we have never had any problems communicating. I experience a warm feeling of relief every time I see her smiling face. It’s strange. These two have not changed at all in the years that I have known them. I look forward to meeting them again and I hope they will always be healthy.